Meet Angie Behm, a busy mother with a full-time career as the director of digital and social strategy for Ant Farm. 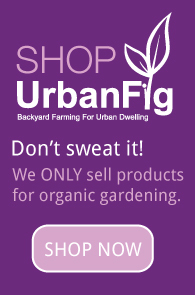 Angie said she was inspired by her friends’ gardens along with UrbanFig. We’re excited to feature a new urban farmer who’s now officially in love with growing her own food. Take it from Angie, you don’t have to be an expert to start a garden. All you need is a little sunlight, soil and the will to let your garden grow. Gardening Advice: Just do it! Grow something, then talk to other people that garden and learn as you grow. I eat a lot of salad and I love to go out to my garden and pick the baby leaves from all the different lettuce plants and combine it with spinach leaves, basil, feathery fennel fronds and strawberries. Then I pick a lemon from my lemon tree and mix the juice with shallots, salt and pepper and this blood orange infused olive oil that I got at Sunstone Winery in Santa Ynez for a delicious salad. My mom and dad were out visiting from Wisconsin for my birthday and we dug the garden by hand using two small garden tools and then found some old bricks around the side of my house to use as a border. The majority of the garden was planted with seeds and then I bought a few small seedlings to grow strawberries, red lettuce and fennel. I like the satisfaction that comes from growing things from seed, but I also like the more immediate gratification of plants so I suggest combining both in your garden. I don’t have a lot of patience to begin with, but there’s something about gardening that allows me to slow down and stop to smell the basil. I am fortunate that my yard has a sprinkler system that waters the garden in the early AM hours. I usually mist it with the hose when I get home from work and other than that, I pull a few weeds here and there. So I typically spend less than 5 minutes each day in the garden, but hours admiring it each week. My mint and basil had a pest of some sort and have thinned out considerably. I am going to buy lady bugs this weekend which you release at night into your garden and they feed on the pests rather than your plants. Also when my son was away visiting my parents in Wisconsin, the first strawberry in our garden ripened to red and I promised him on the phone the night before he flew home that he would have the privilege of picking it and eating it. Of course when I woke up the next morning…low and behold, a bird or squirrel had eaten it clean from the stem. Since then I bought netting, but still haven’t put it over the strawberries because I don’t want it to ruin the aesthetic of the garden, so instead my neighbor told me that I should try sprinkling cayenne pepper around them and that seems to have done the trick so far. How has growing your own organic food affected or changed your life? Why do you think it’s important that people grow their own food? Well…the first time my son ate lettuce was when he picked it out of our garden. I was shocked because it usually requires bribery and threats to try something like lettuce! I think growing your own organic food is not only healthy but also empowering for adults as well as children. I love to see it grow – the moment the buds start peeking out of the soil or when a flower turns into a green strawberry and ripens to red or when you pick your first lettuce leaves and turn it into a fresh salad for friends. While the daily grind of work and routine can certainly get you down, gardening brings such simple joy everyday – get out there and grow something! Next post: Determinate or Indeterminate: What Type of Tomato Should I Grow?